In 1983, Which One Of These Product Categories Was Gutted By A Market Crash? Which Classic Boardgame Has Been Solved For All Possible Outcomes? When we talk about market crashes, we’re usually talking about stock markets or highly traded commodities. In the case of today’s trivia though, we’re not talking about stocks or corn futures, however, but reaching back into history to peek at the then nascent video game industry. Until early 1983, the video game industry was enjoying surging popularity and a roaring level of adoption rates. People had been buying Ataris, ColecoVisions, Oddysseys, Fairchilds, and other second-generation video game consoles hand over fist. In fact, the adoption rate was so high (at least among the segment of the population with an interest in video games and the disposable income to buy a pricey console) that the bottom dropped right out of the market. One day, companies couldn’t make enough to keep up with demand. The next, everyone and their brother had a game system. The event, known in the U.S. as the “video game crash of 1983” and “Atari shock” in Japan, decimated the budding industry. Magnavox pulled out of the gaming market. Imagic, an early video game developer, withdrew their IPO a mere day before the company was slated to go public, which foreshadowed its later collapse. Atari took such a bad beating that it ended up burying unsold stock in a secret landfill out in the New Mexico desert (despite decades of this event being written off as an urban legend, the location was recently excavated in 2014). All told, it would take two years for the video game market to start to recover and, to a very large degree, we can thank Nintendo for the recovery. The release of the Nintendo Entertainment System in 1985 marked the turning point for the video game recession and consumers began buying consoles again. By 1988, 70 percent of all game console purchases were Nintendo Entertainment Systems. One of the most notable long-term side effects of the video game crash, aside from the loss of early video game companies and publishers, was the way that it shaped Nintendo’s policies on video game publishers and third party games. 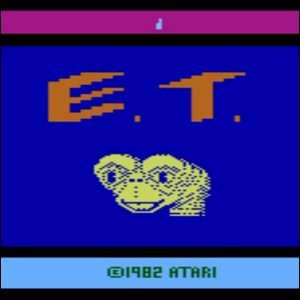 Nintendo felt strongly (and accurately) that part of Atari’s problem was how liberal they had been with allowing anybody and everybody to release games for Atari systems (the game seen here, an adaptation of E.T. : The Extra Terrestrial for the Atari platform is widely regarded as one of the worst games ever created). This, they felt, diluted the prestige of the brand and people lost faith in the platform. Nintendo restricted the number of games that third party developers could release for the NES and used their “Seal of Quality” program to identify games that met their strict quality standards.